Viable and implementable projects have been initiated from Partnership for Technology symposia over the past three years. These initiatives range from quick-impact projects, which use available resources to achieve small-scale yet high-impact results, to strategic cooperation projects that look at leveraging Member States’ capacities, technologies and expertise to enhance the effectiveness, efficiency, agility, and responsiveness of specific areas of field operations. Existing partnership relationships continue to thrive between the United Nations and Member States: Austria, Canada, Denmark, France, Germany, Israel, Italy, Japan, the Netherlands, Republic of Korea, Switzerland, the United Kingdom, and the United States. Mobile Command Centre (MCC)The MCC packs the features and functionality of a small military headquarters within a 20-foot ISO sea container for deployment to remote mission-critical locations. The United Nations Signals Academy (UNSA) was founded in 2015 as an outcome of the first symposium to address the identified gaps in the signals and technological capabilities of Troop and Police Contributing Countries. The overall goal of UNSA is to enhance the preparedness of military and police signals and other targeted uniformed personnel prior to their deployment to a UN peacekeeping environment. ICT training on UN-owned equipment and UN standard operating procedures is standardized, mission-specific, gender-inclusive, and hands-on. Now in its fourth year, UNSA is managed by Office of Information and Communication Technology (OICT) in UN Headquarters, and it is operated at the Regional Service Centre-Entebbe (RSCE) in Uganda. The UN Open Source Enterprise GIS initiative is one of the success stories from the second symposium and was established in March 2016. “UN Open GIS” aims to leverage free and open source-based geospatial technologies in support of UN peace operations. GIS-related think tanks at the event identified the potential benefits of open source applications for use by the field as well as the solutions that would provide opportunities to shape the open source UN GIS architecture. This significant undertaking is ongoing and is supported by Member States, as well as external partners: Geo4All and OSGeo. A comprehensive update on the progress of UN Open GIS can be found here. The MINUSMA Mission Secured Network provides a platform for secure network collaboration within the intelligence community in the mission. It is used to process, analyse and share intelligence gathered through a wide range of sources (military intelligence, political, economic, social and others), which are brought together to empower the mission leadership with a better understanding of the realities in the arena. MINUSMA utilizes this information to produce predictable and actionable intelligence in support of its activities. The expertise and network services were provided through a Letter of Assist (LoA) between the French Government and the United Nations. Mission camps are vulnerable to external threats, such as indirect fire from such sources as mortar shelling and rockets, and Improved Explosive Devices that have been found in the vicinity of camp locations. Critical threats to personnel have also been identified, for example, magnetic mines stuck under UN vehicles. This project aims to enhance the security and level of protection at the Kidal Camp to minimize threat exposure through the deployment and operation of specialized equipment: day/night sensors (cameras and radar); mast with two high-definition long-range cameras, cameras on a mobile mast and ground surveillance radar. This project aims to demonstrate the impact of modern surveillance technology on the detection of asymmetric threats. The aim is to improve camp security for UN peacekeepers, the overall security situation, and quality of situational awareness. The project provides threat assessment for convoy protection to demonstrate the technological potential of the solution, and it comprises deployment and operation of early warning equipment (day/night cameras) on a fixed mobile Hovermast and airborne aerostat platforms to enhance security and incident response times in Bangui. Rapid ICT deployment and service provision by specialized ICT personnel from the THW agency address urgent requirements defined by the UN Mission in Colombia. (THW is a Governmental Organization in the field of civil protection that has provided technical relief in more than 130 countries and is based on the voluntary commitment of dedicated people). Threat situations to mission sites can deteriorate quickly. There have been several instances of riots targeting UN personnel and premises with violence sometimes escalating to a point where an armed response by UN camp guard units is warranted. This project aims to provide greater security and protection at the Gao Camp to reinforce existing measures. This includes the deployment and operation of a modern information fusion system with integrated day/night sensors (cameras & radar); and the installation of a 45m mast with a high-definition long-range camera, an HD camera and ground surveillance radar. The goal of a fully-integrated communications network in the field has been realized through the Modular Command Centre (MCC). 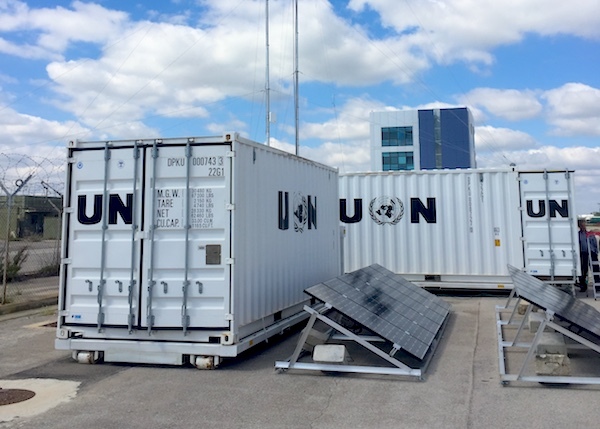 It is a sea container-based configuration designed by ICTD to support the continuous needs of field missions for scalable, rapidly deployable and customizable mobile communications centres capable of hosting the most sophisticated equipment. It was conceived to provide the necessary work environment for a command group to exercise command and control where no permanent infrastructures can be provided and can interconnect different systems in use by military contingents from different nations or UN Agencies into a unique band base, providing safe, reliable and effective operations. The latest generation provides interoperability between a wide range of different communication devices, such as radios, smartphones and computers, and enables a fully-integrated communication network that can be controlled by an MCC operator from a comfortable room within the unit. Funding for five MCCs was provided by Germany.